For three days, Amal lay on the ground. The child was injured in an Israel Defense Forces missile attack on a building in a rural suburb of Gaza City and was left lying there alongside a few dozen other dead and injured family members. She was wounded in the head, was unconscious and everyone who survived the horror was certain she was no longer among the living. But then, after three days, her cousin, who was in shock after the attack, grabbed a stick and in a manic attack began hitting the dozens of bodies lying there. He ran around between them, hitting them, hoping that by doing so he could wake up his family members and bring them back to life. But all the bodies remained frozen in place. The only one that suddenly showed signs of life was Amal. The young girl who was injured in the head began to move, and then surprisingly stood up. The girl who “came back to life,” as told in the documentary film “Samouni Road,” is the star of director Stefano Savona’s film, which was screened last weekend at the Jerusalem Film Festival. She leads the director through the alleyways of her neighborhood, among the houses destroyed in the bombings by the Israeli Air Force and, along with her mother, brother and other members of her extended family she lays out before us the story of the Samouni family, which, lost 29 of its members in Operation Cast Lead in late December 2008 and January 2009. The film sketches out the lives of the family before and after the tragedy, wanders between the past and the present, shows how the daily reality of the residents of the Gaza Strip has changed over the past two decades and succeeds in doing all this using impressive cinematic tools that present the audience with a picture of reality that is particularly disturbing. “Samouni Road” was awarded the prize for the best documentary at the Cannes Film Festival in May, and Savona came to Jerusalem to accompany the screening of his film and answer the audience’s questions. In an interview with Haaretz last weekend, Savona admitted that he was nervous before this screening. He feared the meeting with the public in Israel would be different from his experiences in other countries. Beyond the story it tells, the uniqueness of the film is in its use of animation. 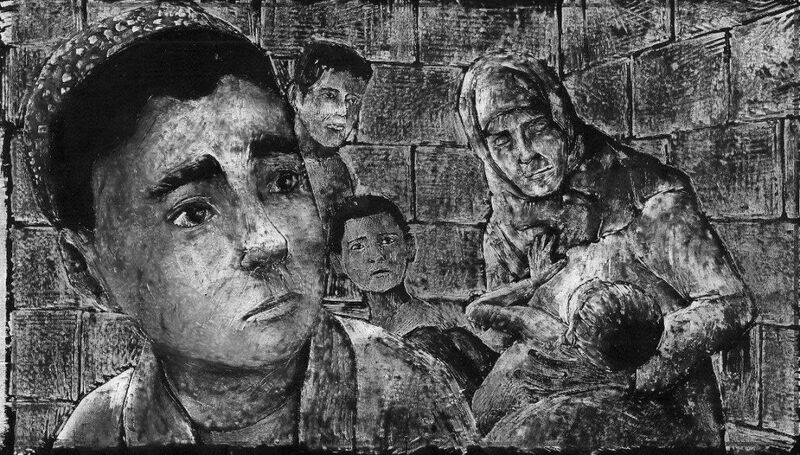 In that respect it is similar to Ari Folman’s “Waltz with Bashir,” in which the director also chose animation to return to the days of the first Lebanon War and to explore memory. Savona’s film wanders between the present, which is portrayed using filmed materials, and the past, which is presented in hand-drawn animation. These flickering images present the family’s life before Operation Cast Lead. But another type of animation, which was created with 3-D software, bursts onto the screen in the second half of the film, presenting the events of the day when the neighborhood was lethally fired upon. These are presented from above, via a sight that appears in the center of the screen and in effect invites the viewers to watch the massacre from the viewpoint of a drone that seemingly filmed the event. Although the events of that day were covered in the media at the time, watching a detailed description of them, moment by moment, is an unsettling experience. After the viewers already get to know the surviving family members during the first part of the film, the animation brings them back to that day in which IDF soldiers invaded the neighborhood, knocked on the door at night, and fired at the father of the family the moment he opened it. Without asking questions, without any inquiries, they simply opened the door and fired, according to the family. Afterwards, the animated reconstructions show how all the residents of the neighborhood were evacuated from their homes and gathered together in one building. From the point of view of the drone we see how planks that were being lifted up in the yard by a few young men who were fixing the fence looked like RPG rocket launchers. In response the sight focuses on the young men, and a missile launched at them. Immediately after the explosion, as they fled into the building into which about 150 neighborhood residents were gathered, the sight follows them, focuses on the roof of the building, and there’s another explosion. Shouts, the noise of helicopters, chaos, and those who remained alive are making their way out, among the bodies of dozens of dead and wounded. They decide to evacuate the site for fear of another shelling, and very soon a long line of figures is seen fleeing the site. On the soundtrack you hear a conversation on the IDF two-way radio between the pilot who fired and someone sitting at headquarters and giving him orders. Savona, an Italian who used to be an archaeologist, arrived in the Middle East 26 years ago, when he was working on a study about the relations between Egypt and Palestine during the prehistoric period. Since then he has spent a lot of time in the countries in the region, and when he decided to become a documentary filmmaker he realized that this region could provide quite a few interesting subjects for his films. During the period of Operation Cast Lead he was in the Gaza Strip. “I felt it was unbearable to see the almost pornographic images of suffering, of bodies that appeared on all the news broadcasts, and they kept showing them again and again, and I felt that I did not understand anything about the war itself,” he says. As a result he started to post photographed reportage about everyday life in the Strip on his blog. When he first heard about the massacre of the Samouni family, the story sounded exaggerated to him. “It sounded like Palestinian propaganda,” he says. A week after the shelling he arrived in the neighborhood and began to talk to family members. Even when he heard their stories, he still thought that it was a distorted and exaggerated version of what really happened there. “At first, I didn’t believe a word of what they said, because it was too much. It sounded like propaganda, and since I am not a professional journalist I felt like I could easily be deceived. But I stayed there and asked questions for a few weeks, and I cross-checked the stories, and said that maybe this is true. Savona didn’t want to create a film that would focus on the day after the tragedy. He wasn’t interested in telling the story of “people who take on the role of the ‘professional victims’ and present themselves this way,” he says. He wanted to emphasize the difference between the lives of residents of the Strip up until the second intifada, when they used to go out to work in Israel every day, and their lives afterwards, when the only Israelis they encounter are soldiers. By doing so he wanted to place the events in context, to give the characters a past as well as a present, and also to reveal something about the vague image of the Israeli enemy. That’s why it’s important to him to include the conversations that were conducted between the pilot and his commander, he says. He didn’t receive a precise record of that conversation on the IDF radio, but Israeli reports that were published noted the main thrust of the words. “When I discovered what really happened from the Israeli point of view and saw the dialogue between the pilot and the person giving him the instructions, I understood that it was very powerful. A year after he filmed the Samounis, they informed him that one of the brothers was about to get married. Savona decided that he had to go back and film the preparations for the wedding, which are interspersed throughout the film. But this time, access to the Strip was difficult. In order to return there, he says, he was forced to pay 4,000 euros. In exchange, he was allowed to cross via one of the tunnels that connected Egypt with the Strip at the time. It was a tunnel about 1.5 kilometers in length; in parts of it he could only get through by crawling, but in the end he reached his destination. Today, on the other hand, he can no longer enter Gaza and visit the subjects of his film, because the tunnels were destroyed, and the border crossings are closed. It’s almost superfluous to mention that the film’s protagonists were unable to leave the Strip in order to attend the screening of the film at international festivals. In order to raise money to make the film, Savona admits that he approached a number of foundations in Israel. But none of them agreed to support such a film. Since he didn’t get any Israeli funding he didn’t seek funding from Arab sources either. And ultimately, he believes that worked to his advantage. “I realized that if you receive funding from one of the sides, you can’t show it to the other side. Whereas now, because I didn’t get money from either side, I can screen it anywhere,” he explains. As for the screening in Jerusalem, he has no regrets.